Out of the Blue has just opened – the latest dining destination at Soneva Fushi in the Maldives. 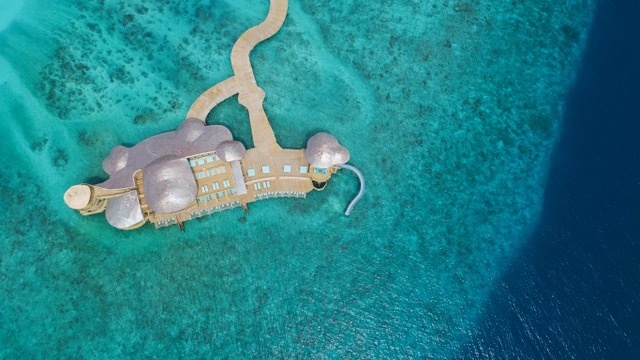 A stunning two-storey, overwater f&b structure housing five brand new f&b experiences, Out of the Blue is comprised of both intimate settings of just a few diners presided over by famous chefs, to much larger, alfresco shared-dining areas for all to enjoy. A move set to strengthen the highly lauded f&b credentials that Soneva already boasts, the star attraction of this new offering is arguably the eponymous Once Upon a Table. An unusual horseshoe-shaped table seating a mere eight diners, Once Upon a Table has no menu, and will have a chef cooking for guests directly – meaning dinners are always a surprise. Central to this new offering is the eponymous 50-seater, all-day dining area Out of the Blue, which hosts a number of different kitchens with international dishes. So Hand’s On is the dedicated sushi counter, seating five diners for lunch and dinner. This outlet is already set to welcome notable young Sushi Master Chef Kenji Gyoten in August – an unmissable treat. In addition: the Chinese Kitchen will be serving modern Chinese cuisine; the Modern Japanese Kitchen, run by Soneva Fushi’s Chef Nikki, is set to serve Japanese delicacies; So Cheesy will be paying homage to all things cheese-related; So Hot, will be meats and vegetable based including the Tandoor Oven, Robata Grill, Josper Grill, Pizza Oven; and finally So Chilled, will be a reincarnation of Soneva’s well-loved chocolate and ice-cream parlour. Finally, the first overwater organic greenhouse in the Maldives has been created – So Fresh. Allowing guests to hand-pick the ingredients they wish to have in their salad, So Fresh is yet another opportunity for Soneva guests to reconnect with nature. Out of the Blue launching is a core component of Soneva’s year-long campaign ‘Festival of Colour’, which celebrates the diverse array of guest activities and experiences. Soneva Fushi will be offering a curated series of personal dining experiences with Michelin-starred chefs visiting from around the globe at Out of the Blue. Soneva has confirmed a huge line-up of additional visiting experts in their fields, including authors, wine producers, world-champion free-divers, astronomers, artists, wellness practitioners, tennis coaches and more.